The Far West Nordic Ski Education Association is hosting their biggest fundraiser for the year at the Truckee Community Recreation Center on October 26th. This is a great opportunity to welcome the coming ski season with good friends, good food, raffle drawings and an auction to benefit the good things Far West does for Nordic skiing. Your $40 dollar admission fee gets you a raffle ticket, dessert bar, taco and burrito bar, silent auction, and live auction. Auction items include ski passes, restaurant dining, ski equipment, art , and outdoor gear and clothing. The grand raffle prize is a "Dream Ski Package:" High end Boots, bindings, skis, poles, and a 90 minute "pick your pro" lesson. 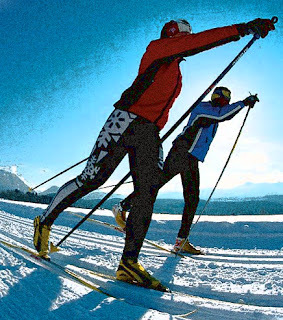 Far West Nordic Ski Education Association (FWNSEA) is a nonprofit organization whose mission is to promote the sport of cross country skiing and facilitate competitive cross country skiing. FWNSEA provides coaching and instruction and produces numerous cross country races at Royal Gorge, Tahoe Donner, Auburn Ski Club, Tahoe XC and other venues. The Truckee Community Recreation Center is located at the Pioneer Center round-a-bout, 8924 Donner Pass Road, Truckee. The 28th annual fundraiser begins at 6:00pm. Tickets can be purchased online or at the door.